In spoken English, words can be emphasized by being pronounced with a heavier stress than usual. This type of emphasis is usually indicated in written English by means of italics or underlining. In the following examples, emphasized words are indicated by means of underlining. Emphatic statements are often used in conversation; for instance, when one speaker is contradicting another. e.g. "I don't believe he works very hard." "Yes, he does work hard." When it is desired to emphasize a verb, it is generally the first auxiliary which is stressed. For instance, in the sentence I am working hard, the verb can be emphasized by stressing the auxiliary am. e.g. I am working hard. I work. I do work. You work. You do work. He works. He does work. She works. She does work. It works. It does work. We work. We do work. They work. They do work. I worked. I did work. You worked. You did work. He worked. He did work. She worked. She did work. It worked. It did work. We worked. We did work. They worked. They did work. It is ready. It is ready. They are ready. They are ready. I was ready. I was ready. It was ready. It was ready. They were ready. They were ready. Simple Present I work. I do work. Present Continuous I am working. I am working. Present Perfect I have worked. I have worked. Present Perfect Continuous I have been working. I have been working. 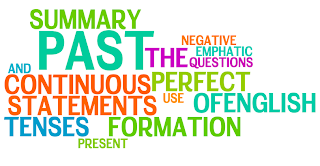 Simple Past I worked. I did work. Past Continuous I was working. I was working. Past Perfect I had worked. I had worked. Past Perfect Continuous I had been working. I had been working. Simple Present of to be I am ready. I am ready. Simple Past of to be I was ready. I was ready. It should be noted that questions may be emphasized in the same way as statements. He does not know the answer. He does not know the answer. He doesn't know the answer. He doesn't know the answer.